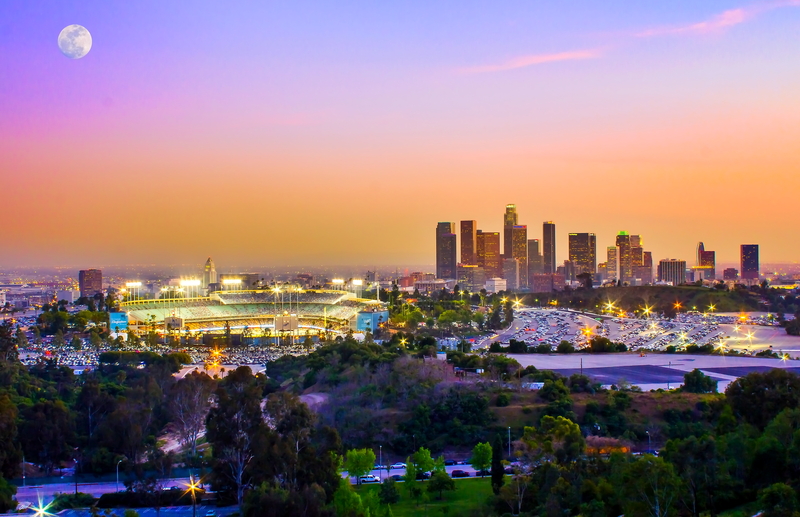 Dodgers stadium and Los Angeles skyline during twilight at full moon. Dodger Stadium Express service for the 2019 baseball season begins Tuesday for the exhibition game against the Los Angeles Angels and then starts for the regular season on Opening Day on Thursday, March 28, against NL West rival Diamondbacks. 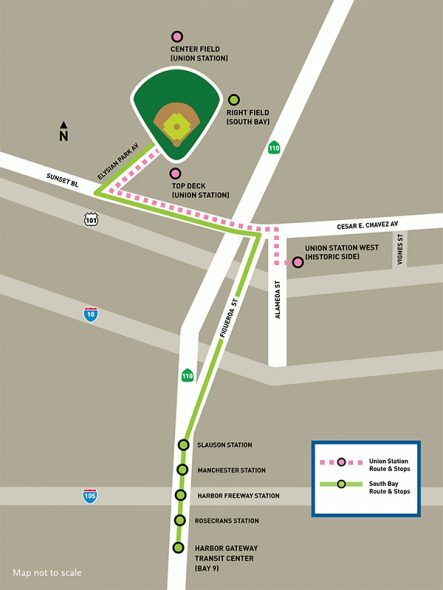 Buses run to the ballpark from Union Station in downtown Los Angeles and Harbor Gateway Transit Center in Gardena. Fans with a ticket to the game can ride the Dodger Stadium Express for free. Service from Union Station begins 90 minutes prior to the start of the games and runs until 45 minutes after the end of games. Service from the Harbor Gateway Transit Center begins two hours prior to the start of the games and ends 45 minutes after games are over. The Dodger Stadium Express from Union Station will pick up Dodger fans every 10 minutes in front of Union Station near the Taxi stop located near the Imperial Western Beer Company. Service will continue to Dodger Stadium via Sunset Boulevard and Cesar Chavez Avenue. Passengers can use two stops at the ballpark — either behind center field or at the top deck. From Harbor Gateway Transit Center, fans can board buses located at Bay 9, with buses running every 20 minutes. Fans will be dropped off behind right field at Dodger Stadium. Buses back to Harbor Gateway Transit Center will pick up patrons at the same location after the game. Fifty percent of the cost of the Dodger Stadium Express is being provided under a grant from the Mobile Source Air Pollution Reduction Review Committee (MSRC). Metro provides the rest. The Dodgers help publicize the service. The Dodger Stadium Express bus service has transported more than two million fans since service began in 2010. During the 2018 season, more than 371,000 fans rode the bus to Dodgers games, including the post-season. Union Station is the transit hub for Southern California and is served by Metro’s Red/Purple Line subway, Gold Line light rail, Metrolink commuter rail and Amtrak, as well as numerous bus lines. If driving, parking at Union Station is $8. For sellout games, parking can fill up. Metro timetables and maps are here. For fans of the other Los Angeles baseball team, Metrolink is offering special Angels Express train service to Los Angeles Angels of Anaheim home games to help fans avoid traffic congestion and parking hassles. The Angels Express will service all 49 Angels weekday home games that start at 7:07 p.m.